At present time EURUSD near to our advanced Fibonacci Buy Stop Line 1.09548. So we expect here perfect Buy Trend. 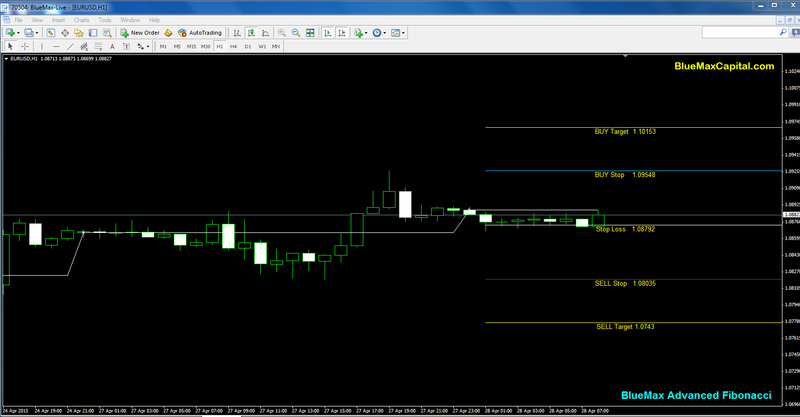 When the market reach 1.09548 we can conform once again our sell entry point using the above Fibonacci. According to today’s New York session if EURUSD crossed our given buy Stop 1.09548 means it will reach the buy Target point 1.10153 sure .Here we recommend to maintaining the stop loss value 1.08792 to avoid any huger losses suppose market taken reverse order means. Alternatively if market move to sell trend means we can use the entry point as 1.08035 and we can place there our exact profit point as 1.0743 by the way of our BlueMax Capital Ltd Advanced Fibonacci tool alert. For sell order stop loss value is 1.08792. Due to ,today USD currency bank data’s EURUSD market expecting more sell trend .Because USD “S&P/CS HPI Composite - 20 n.s.a. (YoY) (Feb) ” Forecast 0.2 is increase from Previous 0.00. So all the EURUSD Traders recommend to choose sell order more.